I came across two answers Bhagavata-Purana Considered as best and Devi Bhagavata Purana Considered as best. On the same lines, are there any claims about other puranas claiming themselves or others as the best, foremost etc.? This Purana is the best remedy for the biggest danger like the death, which bites like the snake and is the biggest danger. The Šiva Purana is the best of all the Puranas. O Great ascetic, initially it was spoken by Lord Siva himself. Except the Siva Purana, there is no other remedy in the age of Kali, to purify the minds of the people. O Best of the sages, only such of the intelligent person gets an opportunity to listen or read it, who has to his credit the noble deeds of the earlier births. The Siva Purana is admittedly the best of the Sastras and is also the true form of Siva on earth, therefore, it should be read, narrated, listened studied and well thought over. Yes , in Shiva-Mahapurana we also find the similar description in Mahatmyam or Glory part. Chapter 1 Shloka 12 - The glory of the purana. The Shiva-Purana is admittedly the best of the Shastras and is also true form of Shiva on earth.Therefor it should be read narrated , listened , studies ans well thought over. 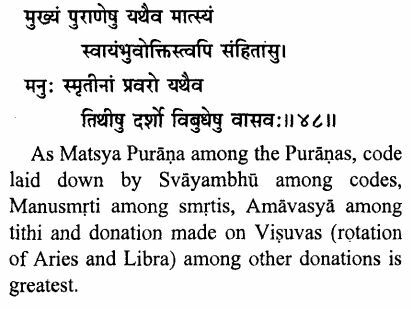 As Matsya purana among puranas, Code laid down by Swayambhu among the codes, Manu Smriti among Smritis, Amavasya among Tithis and Donation made on Visuvas (rotation of Aries and Libra) among other donations is greatest. In the above shloka Vishnu purana is declearing Matsya purana is greatest among puranas. Not the answer you're looking for? Browse other questions tagged puranas shiva-purana padma-purana linga-purana matsya-purana . Could someone tell me about Radha amd Krishna in the Devi Bhagvata Purana?